Pour olive oil into a quiche pie plate. Spread with a paper towel to coat pie plate and remove excess oil. Thaw and drain spinach and mix all ingredients together. Bake 350 °F (175 °C) for about 40 minutes or until center sets. Cool and cut into 6 wedges. 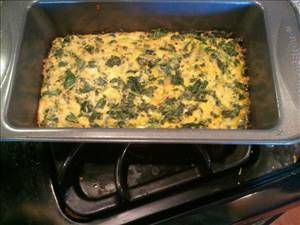 There are 176 calories in 1 serving of Spinach and Egg White Quiche. Calorie break-down: 51% fat, 8% carbs, 41% protein.